Rapidmail is a cloud-based software for professional email marketing. Create and send professional newsletters or automated emails with no prior knowledge. Connect your shopsystem with rapidmail to send your transactional emails like order confirmations and invoices via rapidmails transactional infrastructure to combine highest security with best deliverability. To authorise, simply follow the steps as described below and make sure you meet the requirements to be able to sync. We need your API username and API password. For rapidmail, we need authorization per LIST. This means you need to set up a new connection for each LIST you want to keep in sync. You can choose from all your existing LISTS in the authorization step after entering your login details. 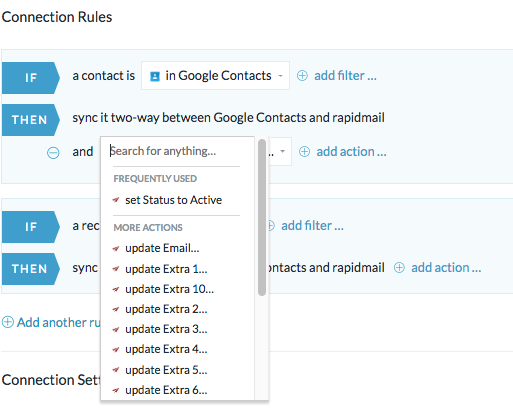 If you already authorized rapidmail account(s) in the past or in any other PieSync integration, you'll be able to skip the first part of the authorization and choose from your CONNECTED ACCOUNTS. 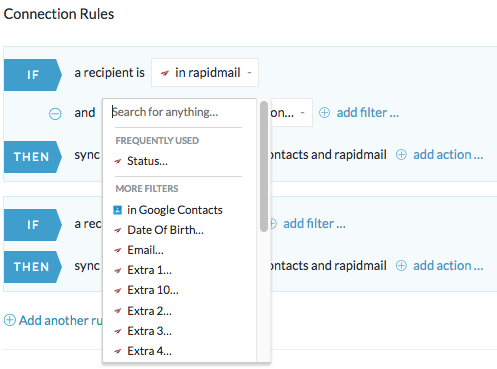 For now, we don't support rapidmail customizable contact fields. Therefore, you can only custom map any additional standard fields that aren't included in the default mapping yet. Bear in mind a mapping between two fields can only exist if the types of fields are compatible, and the particular compatibility will determine the direction of the mapping as well. More information on Customizable Field Mapping here. Rapidmail uses "extra fields". These are simple text fields which you can personalize depending on your use case. Please note that you can only amend the name of these fields and not the value. Currently, there are no rapidmail integrations on the PieSync platform that support our deletions sync. Currently, there are no rapidmail integrations on the PieSync platform that support our unsubscribes sync.